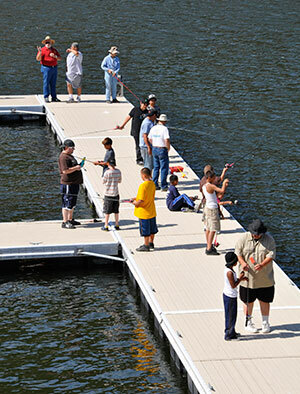 Fishing is an all-year activity at Lopez. Crappie, red-ear sunfish, and largemouth and smallmouth bass provide the best angling in warmer months. Catfish have exceeded 25 pounds in Lopez Lake and are easily caught at dusk and dawn year round. Lopez Lake is just ten miles east of Arroyo Grande off Hwy 101 about half way between San Francisco and Los Angeles. Many Central Coast visitors make Lopez Lake a staging area for visits to wineries, golf courses, historic sites, and Hearst Castle—all easy drives from Lopez Lake. Cast your line into Santa Margarita Lake and you’ll find largemouth bass, crappie, bluegill, redear and catfish. Fishing is good from shore or try your luck from a boat or canoe. Though noted for its excellent fishing and peaceful boating, the park also hosts a vast range of hiking and riding trails which offer breath-taking views of the lake and surrounding mountains. Santa Margarita Lake is approximately seven miles southeast of Hwy 101 and Hwy 58 near the town of Santa Margarita. With thousands of acres of unspoiled open space, the park is home to countless species of plants and wildlife making it the perfect location for nature study, boating and fishing. Visitors can also enjoy other activities along the central coast including historic sites, golf courses, wineries and Hearst Castle – all a short drive from Santa Margarita Lake. Store Hours: Please call for most updated hours. Typically around the same time the front gates open and close. The store is being operated by Rocky Mountain Recreation Company. Now an established tradition at our County Park lake facilities, our fishing clinics at Lopez and Santa Margarita Lakes are meant for both kids and the young at heart. Youngsters and newcomers to sport fishing are given expert instruction by volunteers who are veteran fisher-folk from around the county.